hand block printed kurti we makes thes kurti in block printed cotton fabric. we manage a exports quality. our moto clints satishfucations. We are a prestigious company that is engaged in offering a superior quality Handmade Block Print Cotton Kurti. This cotton kurti is well checked by quality controllers before delivering to customers in order to ensure its defect free range. Offered cotton kurti is distinguished in the market for its high quality & eye catchy look. 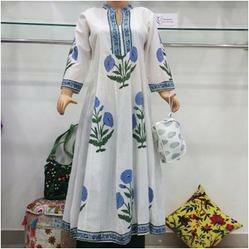 Our esteemed customers can purchase this cotton kurti from us in customized options as per their requirements. Looking for Hand Block Print Kurtis ?